*Department of Geology. Atomic Energy Commission of Syria. P.O box 6091, Damascus, Syria. The aim of the present work was to investigate possible spatial fault-related radon changes, which could reveal some important features related to the active nature of local tectonics along the bounding fault of the Ghab basin. Despite its active historical record, the Ghab fault is presently characterized by apparent lack of earthquake activity with a temporal period of seismic quiescence. Seven sites were selected to perform soil radon sampling along the fault using an AlphaGUARD radon monitor. The average background of normal radon emission from local soil and rocks was established apart from the tectonic influence of the fault zone. A statistical range of anomalous radon variation was defined by the limits of the mean value plus/minus two standard deviations (X±2SD). The initial results revealed high radon increases in the sampled stations along the fault zone, with peak values about 4-5 times above the background level. Although such relatively anomalous concentrations may confirm the usefulness of soil gas radon as a possible indicator for tracing the basin-bounding fault, they do not necessarily prove a definite relation with actual active tectonics in the area. However, these increases may possibly indicate evidences of enhanced radon response to a higher permeability medium associated with the deformed structure of the rupture zone. El propósito de este trabajo consistió en investigar posibles cambios de radón relacionados con la zona de falla que pudieran mostrar alguna relación con la tectónica local a lo largo de la zona de falla de la cuenca de Ghab. A pesar de su actividad histórica, la falla de Ghab presenta actualmente una falta de actividad sísmica con un periodo largo de quietud sísmica. Se escogieron 7 sitios para realizar muestreos de radón utilizando un equipo ALPHAGUARD. El valor promedio normal de radón de fondo se obtuvo con medidas realizadas lejos de la zona de influencia de la falla. Se definió un rango estadístico de variaciones anómalas de radón con límites marcados por el valor promedio mas/menos dos desviaciones estándar (X+/- 2DS). Los resultados iniciales muestran incrementos de radón en las estaciones de monitoreo a lo largo de la zona de falla con picos 4-5 veces mayores que el nivel de fondo. Aunque estas concentraciones anómalas relativamente grandes podrían confirmar la utilidad del radón como un posible indicador para trazar los límites de la falla, no prueban necesariamente una relación con la actividad tectónica del área. Sin embargo, estos incrementos de radón podrían indicar una evidencia de zonas con mayor permeabilidad asociadas a la deformación de la estructura en la zona de ruptura. The Dead Sea fault system (DSFS) represents a prominent strike-slip transform structure in the eastern Mediterranean region. The system has been regarded as an active plate boundary formed by the separation of the Arabian plate (east) from the African plate (west) in mid-Cenozoic (Barazangi et al., 1993). As a remarkably important structural feature, the DSFS has become the focus of attention for many researchers who studied its seismotectonic evolution and paleoseismic history using different approaches (Darkal et al., 1990; Devyatkin et al., 1997; Ambraseys and Jackson, 1998; Brew et al., 2001; Gomez et al., 2003). However, Megrhaoui et al. (2003) found that the seismic behavior of the northern DSFS seems to pass currently through a quiescent period with a seismic gap of ~830 yr without any occurrence of major earthquakes. 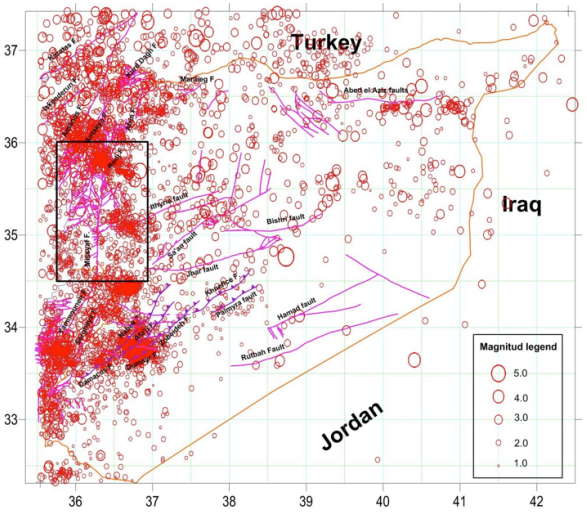 Moreover, Abdul-Wahed and Al-Tahan (2010) pointed out that the seismicity of Syria is actually characterized by a very limited number of focal mechanisms with apparent low level seismicity. Accordingly, they concluded that the earthquake activity in the country is presently distinguished by producing a little number of low magnitude seismic events. Although the prevailing period of seismic quiescence implies that the system has been seismically inactive in the last few centuries, and this might be a sign of high level of seismic hazard in the region due to a probable potential strain accumulation (Ambraseys and Barazangi, 1989). Considering the peculiarity of the Ghab depression as a distinctive pull-apart basin of the northern DSFS, it seems very important to explore the observed status of seismic quiescence prevailing over such tectonically vital area. One encouraging technique for achieving this goal is probably the use of soil gas radon measurement, which has been recognized as a significant natural tracer for characterizing the structure of subsurface faults in several tectonic regions throughout the world (King et al., 1996; Baubron et al., 2002; Steinitz et al., 2015). Thus, considerable information concerning the trend and location of the fault, besides understanding the nature of its tectonic activity, could be obtained through analyzing the distribution pattern of radon emission in the survey area (Etiope et al., 2002; Al-Hilal and Abdul-Wahed, 2016). Accordingly, the main objective of this study is to check whether the bounding fault of the Ghab pull-apart basin shows any spatial tectonically-induced radon anomalies that might be useful for mapping out the trend of the fault, and providing further information concerning the current active status of its local tectonics. The DSFS location, local seismicity and the study area are shown in Figures 1 and 2. The Ghab depression (~55 × 15 km), located along the eastern flank of the Syrian Coastal Mountains Range, is a flat marshy trough that is filled by thick horizontal Pliocene lacustrine sediments (Ponikarov, 1966; Devyatkin et al., 1997). The prevailing Pliocene sediments consist basically of marls, calcareous marls and clays alternating with sandstones and well cemented conglomerate beds at depth. The Pliocene is covered by a thin sheet of Quaternary (Pleistocene and Holocene) formations, which are represented mainly by unconsolidated deposits including reddish and dark clays, sandy loams, pebbles, flood plain and alluvial fans of fleeting valley deposits. The Paleogene rocks (Middle Eocene) are outcropped in the northeast border of the Ghab basin, where they are composed essentially of soft chalky and nummulitic limestone, clayey limestone and marls. Cretaceous rocks (Cr 2), which outcrop directly in the eastern edge of the study depression, are commonly formed by limestone and dolomite rocks that are struck by a number of distinct faults and fractures (Figure 3). Figure 1 Regional tectonic map showing the location of Syria relative to the Arabian, African and Eurasian plates. Figure 2 Instrumental seismic activity in Syria during the period (1995-2012). The rectangle indicates the location of the present study area. Figure 3 Geological cross-section across the Ghab pull-apart basin. 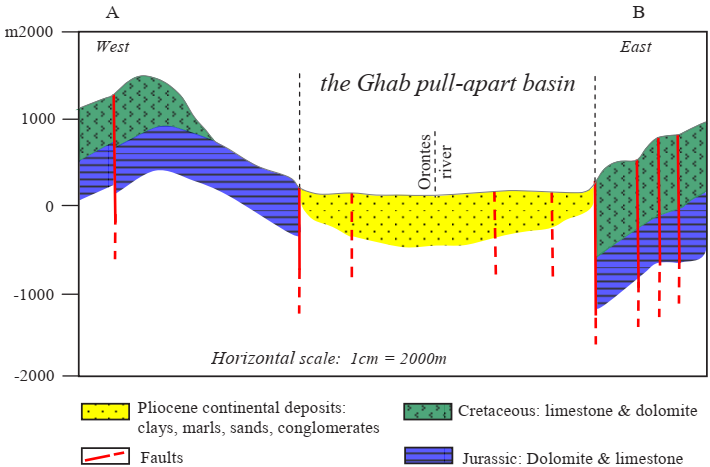 Tectonically, the Ghab depression represents a deep pull-apart basin that developed through the structural evolution of the northern DSFS since Pliocene (Ponikarov, 1966). To the south of the study area, the main fault merges with Missyaf narrow segment (~60 km long) which extends between the Boqeia pull-apart basin (south) and the Ghab depression (north) (Figure 4). Missyaf fault splays northward into two distinctive segments bounding the Ghab trough from western and eastern flanks, and thus forming the general framework of its actual structure. Brew et al. (2001) defined the Ghab pull-apart basin as a Pliocene-Recent tectonic feature that was formed as a deep structure opened in response to a complex mechanism of a left-step movement in the northern DSFS. 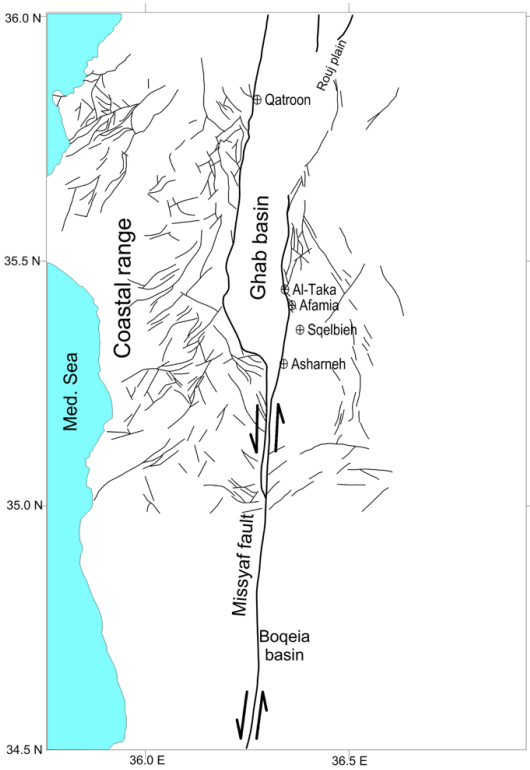 Unlike the eastern side, the western border of the Ghab basin is hardly defined because it is hidden by the accumulation of various mass-wasting materials, and is mostly concealed below some large blocks detached from the flank of the adjoining coastal range. However, the general margins of the Ghab depression are sufficiently outlined by a series of faults with distinct blocks and scarps along which the central part of the main basin is subsided (Figure 3). Figure 4 Locations of radon moni toring stations along the bounding fault of the Ghab pull-apart basin. The lack of seismicity which characterized the main fault segments of the northern DSFS such as the Missyaf and Ghab faults throughout the last century is still observed during the recent time (Figure 2). Although the study region had been historically considered as a seismogenic source of numerous moderate-to-large earthquakes in the past, it currently shows an apparent status of seismic quiescence (Meghraoui, 2015). On other words, the lack of major seismic events with Mw > 6.0 on most segments of the main fault system in the last century appears to be incompatible with its historical catalogue (Ambraseys and Jackson, 1998). Analysis of data from the Syrian National Seismological Network (SNSN) revealed that the seismic activity along most segments of the northern DSFS in Syria produce a little number of low magnitude seismic events (Abdul-Wahed and Al-Tahan, 2010). Additionally, the distribution of epicenters of earthquakes in the region has shown that the instrumental seismicity along both the Ghab and Missyaf segments is very low (Figure 2). Moreover, historical and recent seismic data of Syria provide evidence indicating that the seismicity in the concerned region tends to fade out with time through the last millennium. The locations of radon monitoring sites were chosen in accordance with the convenience and accessibility to the surveyed area, besides extensive geological and tectonic field investigations. Accordingly, seven soil gas radon monitoring stations were determined within four main locations, namely Asharneh, Afamia, Al-Taka and Qatroon all of which are located along the bounding fault of the Ghab basin (Figure 4). The first three stations were established at Asharneh area and the next two stations were set up at Afamia, besides one station for each of Al-Taka and Qatroon sites. The radon stations of Asharneh and Qatroon are located on the southern and northern ends of the Ghab trough respectively, while the other two stations (Afamia and Al-Taka) are situated along the eastern fault boundary of the Ghab depression. However, the western margin of the Ghab basin seems to be not appropriate for carrying out radon measurements because no surface expression could be identified along the western fault boundary, except in the far north where the Qatroon village is located. This obstacle along the western boundary of the study basin is mostly related to the rough topographic relief due to the burial by mass-wasting and accumulations of very large rocky blocks from the adjoining mountain ranges. An additional station for determining the normal level of radon background in the region was chosen near Sqelbieh town, which is located over a stable plateau at ~20 km to the east of the Ghab basin, away from any tectonic influence of the fault zone (Figure 4). Finally, all monitoring stations including the background area are characterized by similar lithological facies of Pliocene continental deposits that are covered by a thin unconsolidated weathered horizon of recent formations. In this work, the measurements of radon concentration in soil gas were achieved through an method, using a portable AlphaGUARD PQ2000 Pro radon monitor. In practice, at each measuring point a hole of 75cm deep and 2cm diameter was drilled in the ground and the soil probe inserted into the hole. With the system tightened from all sides, the soil gas radon is automatically drawn out into the ionization chamber of the instrument with a steady continuous pumping rate of 0.3L/min. As radon level in soil usually shows an initial growth before it is stabilized, the radon activities were registered in 10-min intervals over about one hour period, at each sampling point. Consequently, an average value of radon in soil concentration (Bq m-3) can be measured with fairly good confidence. Table 1 Statistical characteristics of soil gas radon concentrations measured along the bounding fault of the Ghab pull-apart basin in western Syria. Table 1 summarizes the basic statistical characteristics of the resultant radon concentrations in soil which have been measured at seven monitoring stations that are distributed along the bounding fault of the Ghab basin. In order to avoid possible effects of meteorological variables on soil radon concentration, the survey was fulfilled under comparable weather conditions during the years 2010 and 2011. Besides, the normal background level (BG) of soil radon activity in the study area was established in a separate stationary site that is located apart from the tectonic influence of the fault (Figure 4). On this basis, the average BG of radon production was estimated as ~5000 Bq m-3, whereas, radon measurement along the rupture zone of the fault showed relatively higher concentrations, with peak values of about 4 to 5 times higher than the average BG level. In view of that, two separate groups of soil radon concentration values were identified (Figure 5). The first represents the background population indicated by a red solid curve and characterized by low average value of ~5000 Bq m-3. While the second group points to the anomalous population marked by relatively higher values (4-5 times higher than the BG level), and it is defined by a range of the mean value plus-minus two standard deviation (X±2SD). Radon data of this range is regarded important because they are spatially consistent with the trace of the fault rupture, and thus they could be considered as anomalous or geotectonic related values. Meanwhile, it is worth mentioning that the geology of the study region, including the Ghab area and its surroundings, is commonly marked by a general decrease of radioactivity level because of the lack of any natural radioactive source such as igneous acidic rocks. Hence, the estimated BG level of radon activity in the concerned region was found to be fairly low (~5000 Bq m-3). Such relatively low radon concentration might be referred to the low corresponding values of radium (226Ra) content found in nine soil samples taken from the same sites where the radon measurements were carried out. The collected samples were dried, sieved and chemically analyzed for determining 226Ra content in soil using gamma-ray spectrometry technique. Although some samples revealed low radium values ranging from 12.00±1.50 to 14.28±2.95 Bq kg -1, most of the analysis results were below the detection level (BDL), where DL =12 Bq kg-1. Figure 5 Soil gas radon variations measured at seven stations distributed along the bounding fault of the Ghab basin. (BG): background level; (X): mean value; (X±2SD): mean value plus-minus two standard deviations. The results of soil gas radon measurements revealed comparable concentration values. The average radon concentration was found to be 23200 Bq m-3, with a standard deviation of 3484 for Asharneh station; 22128 Bq m-3, with a standard deviation of 2908 for Afamia station; 21542 Bq m-3, with a standard deviation of 2774 for Al-Taka station and 21504 Bq m-3, with a standard deviation of 2528 for Qatroon station (Table 1). For this set of radon data, the range of anomalous radon variations was estimated to be within the limits of the mean value plus and minus two standard deviations (X±2SD). According to Figure 5, it can be noticed that radon concentrations in all monitoring stations seem to be compatible, and they show almost similar variations with remarkable increases of radon values in comparison with the background level. Furthermore, considering the BG radon level in the survey area (~5000 Bq m-3), a wide range of differences can be observed between the values of anomalous radon measured along the basin-bounding fault, and the BG. In other words, the value of “signal-to-background ratio” was found to vary between 4 and 5. All fault-related radon concentration values appeared to be lye within X±2SD. The “signal-to-background ratio” may reveal a possible spatial relationship with the trend of the underlying deep-seated faulted structure. The appearance of such distinct anomalous radon signals could be attributed to the presence of deformed geologic medium associated with a high permeable zone along the detected rupture zone. Also, they may indicate the occurrence of upward flow of deep soil gases which probably provide a driving mechanism that enhance the emanation of radon through openings and fractures up to the earth surface. However, it is worth to mention that applying radon technique in a seismogenic region does not essentially imply that it is possible to refer any radon peak or anomaly to a specific seismic event or active fault. Hence, there is always a probability of error or false prediction connected with this type of analysis. In principle, radon is transported through the ground either by underground water or by carrier soil gases, such as CO2, CH4 and He. Yet, the mechanism of radon migration in both cases greatly relies on the degree of soil permeability and the extent of deformation and fracturing in rocks, regardless of their geotectonic activity (Etiope et al., 2002; Lopez et al., 2016). In fact, there are many cases in which the level of soil gas radon concentrations, measured over tectonically deformed structures or fault zones, displayed abnormal variations whether the fault was active or inactive. Al-Hilal and Abdul-Wahed (2016) found that permeability properties rather than local tectonic activity seemed to be the main causes controlling the emissions of high radon production along the Damascus fault. Moreover, Lopez et al. (2016) mentioned that the emanation of soil radon, measured in west Texas, is mainly related to the transport properties of the geologic medium and not to deeper seismic activity. Additionally, while conducting radon measurements in groundwater along the Serghaya fault in SW Syria, Al-Hilal (2016) found that anomalous radon signature is not necessarily a reflection of active tectonics along the fault, but is most likely an evidence of radon response to the groundwater table fluctuations due to high precipitations. Furthermore, Mojzes et al. (2017) deduced that soil radon activity, measured across the assumed fault line in central Slovakia, did not reflect any sign of active local tectonics, but simply indicates the presence of contact zone between different types of rocks. Nevertheless, the correlation between the rate of soil gas radon emission and the position and trend of buried faults or hidden tectonic lineaments has been repeatedly raised through numerous studies in the last decades (King et al., 1996; Baubron et al., 2002; Steinitz et al., 2015). However, the concept of employing radon to serve as a potential sensitive tracer for evaluating the geodynamic activity of faults is a complex issue requiring primarily full understanding of the seismotectonic setting in the surveyed region. Besides, it is important to define the type of movement along the fault and its extension within the Earth’s crust, and determine whether it is related to deep-rooted structure or just a superficial fracture. Furthermore, radon may exhibit different concentration values with respect to various types of rocks. Thus, particular attention should be given to the local geology and the prevailing rock/soil types in the survey area, especially when interpreting the data of spatial fault-associated radon anomalies. With reference to the Ghab basin, where the present study has taken place, it is important to remember some distinctive features and geotectonic characteristics of the basin structure. 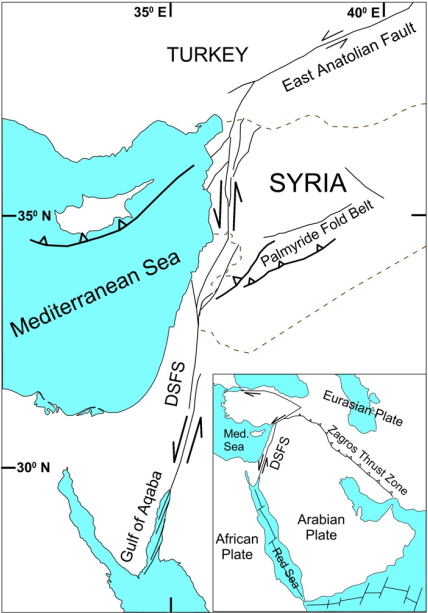 First, the outer boundary of the Ghab pull-apart basin displays a strike-slip fault movement, which developed as part of a major sinistral transform along the northern DSFS in Syria. Second, the fault represents a remarkable deep-rooted structure that opened in response to a left step motion in the DSFS during the Pliocene and Holocene. Third, it has been demonstrated that the Ghab fault accommodates a significant part of active deformation along the Arabian-African plate boundary (Barazangi et al., 1993; Brew et al., 2001; Gomez et al., 2003). On the other hand, despite all the aforesaid tectonic field evidences, the record of instrumental seismicity of the concerned region including the Ghab and Missyaf fault segments appears quite poor with evident lack of important earthquake activity in the past century. Besides, GPS survey which was recently completed in western Syria has shown unexpected results revealing average geodetic velocity less than 0.6 mm/year, which seems quite a low value compared with the southern part of the DSFS (Alchalbi et al., 2010). These observations may be referred to the thought that the northern DSFS is actually passing through a temporal period of seismic quiescence. Thus, the low observed average of slip rate velocity and the scarceness of major earthquake occurrences along most segments of the northern DSFS in the last centuries appear to be in contradiction with the historical catalogue of the system (Ambraseys and Jackson, 1998). Figure 5 shows notable radon increases with evident anomalous signatures trending in accordance with the trace of the fault zone. Such high radon signals are likely due to the presence of upward flow of soil gases through a permeable geological structure associated with the fault zone. This finding is consistent with the main purpose of this work, which aimed basically at attesting the sensitivity of soil gas radon as a potential tool to characterize fault structure. Although the ultimate results confirmed the existence of spatial relationship between the general trend of radon emissions and the probable trace of the rupture zone, the magnitude of soil radon values do not seem sufficient to determine the active nature of local tectonics along the concerned fault. In other words, considering the concentration values of the measured soil gas radon in this survey, it can be inferred that the general level of radon activity is relatively moderate with peak values of about 4-5 times higher than the estimated BG level. These moderate radon values appear to be in a general agreement with the recently obtained data of the near-field GPS measurements that show low level of slip-rate velocities along the plate boundary of the northern DSFS. Moreover, the modest levels of our soil gas radon concentration appear to be in harmony with the present day status of seismic quiescence, and they might be explained by the assumption of probable continued accumulation of interseismic strain along the fault system. Concerning the CV value which indicates the degree of radon homogeneity as a variable element in soil, a higher CV implies a lower degree of homogeneity and vice versa. As shown in Table 1, it can be noticed that the level of CV for the measured soil gas radon data appears quite low, with values ranging between 13-15%, and this reflects high homogeneity degree of soil gas radon. Such distinctive homogeneous level is most likely related to the compatible distribution and similar variations of soil gas radon concentration in all sampled stations along the fault zone. This result may possibly indicate that the selected sites of soil gas radon measurements are particularly located right on the trace of the assumed fault axis, which almost extends along the outer margin of the Ghab pull-apart basin. Lastly, from the perspective of the regional earthquake hazard assessment, the actual period of seismic quiescence and the apparent lack of instrumental seismicity may not reflect the realistic hazardous nature of the studied fault zone. On the contrary, they might be a precursory sign of probable high level of potential seismic hazard, particularly in terms of earthquake cycle and continual strain accumulation along the fault system. Soil radon survey was carried out, during 2010 and 2011, in seven selected sites that are distributed along the bounding fault of the Ghab pull-apart basin in western Syria. The study region is presently marked by a temporal period of seismic quiescence with apparent lack of instrumental seismicity. The results of soil radon data presented herein revealed two separate levels, one represents the background level and the other indicates a distinctive group of anomalous values defined by the limits of the mean value plus-minus two standard deviations. The values of high radon anomalies showed evidences of spatial increases trending in accordance with the assumed trace of the concerned fault. This finding may suggest the usefulness of using soil gas radon technique as a sensitive indicator for mapping out underlying tectonic structures. Although these observations may point out that abnormal radon emissions could provide evidence of a spatial relationship with the trend and location of the rupture zone, they do not seem sufficient enough to demonstrate a reliable assessment regarding the active tectonic nature of the fault. In other words, the moderate level of radon concentration measured in this work seems to be consistent with the current status of seismic quiescence in the region and appears in a general agreement with the low level of slip-rate velocity obtained by the GPS investigations in NW Syria. Hence, such prevailing seismic conditions may possibly influence the rate of soil gas radon release and thereby reduce its level along the bounding fault of the Ghab basin. Finally, considering the viewpoint of regional seismic hazard, it is believed that the prevailing seismic quiescence which exceptionally characterized the system during the last century may indicate that the northern DSFS is presently locked and is accumulating interseismic strain. If so, this could be a warning sign for probable occurrence of large-magnitude earthquakes in the future. The authors wish to express their thanks and gratitude to Professor I. Othman, Director General of the AECS, for his constant encouragement. We would like also to thank Dr. Z. Kattan, Head of the Geology Department of AECS, for his support. We thankfully acknowledge the anonymous reviewers for their valuable suggestions that considerably improved the quality of the paper.